The rotator cuff is a group of four mucsles which originate from the shoulder blade (scapula) and insert as a cuff of tissue around the ball (humeral head) at the top of the bone in the arm called the humerus. 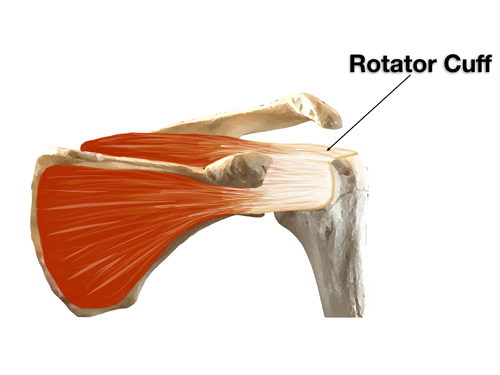 These four muscles rotate and elveate the arm thus the name "rotator cuff." The 4 muscles are the supraspinatus, the infraspinatus, the subscapularis and the teres minor. Tears in the rotator cuff can cause severe pain the shoulder. This often initially occurs with overhead activity, but eventually may become severe, especially at night. 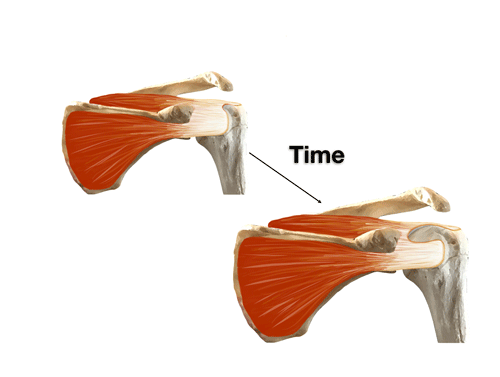 Rotator cuff tears typically occur in people greater tha 40 years old. Other than pain people with rotator cuff tears frequently notice weakness in the shoulder and occasionally cracking or grinding sensations (crepitation) in the shoulder. Unrepaired Rotator Cuff Tears may progress and become irreparable. Long-standing tears may progress to muscle atrophy and fatty degeneration that compromises functional outcome after repair. Massive tears that are irreparable can also progress to a specific kind of arthritis known as rotator cuff arthropathy. The cause of rotator cuff tears is unknown, but is likley multifactorial including intrinsic degeneration of the tendon, poor potential for tendon healing, vascular insufficiency, repetitive trauma, and extrinsic mechanical pressure from the surrounding coracoacromial arch. There likely is an inherited predisposition to RTC disease as well. 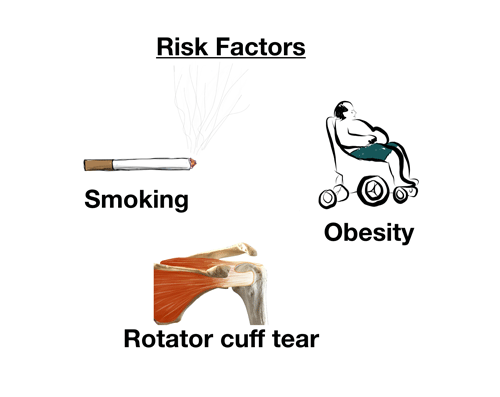 Non-operative treatment options for rotator cuff tears include: activity modifications, non-steriodal antiinflammatory medications, icing, and physical therapy or a home based shoulder exercise program. 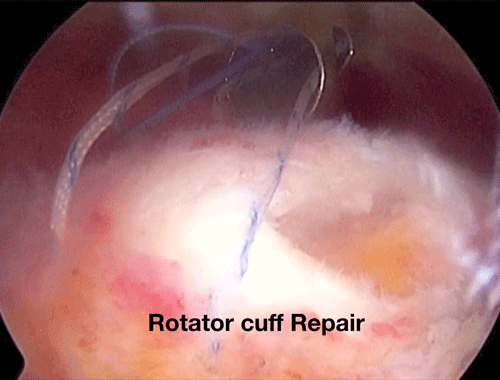 Surgery for rotator cuff tears typically is done using shoulder arthroscopy *shoulder scope) with rotator cuff repair. Other options include: open rotator cuff repair. Massive tears may be better treated with superior capsular reconstruction, tendon transfers, or reverse total shoulder arthroplasty. The surgery that is best for a specific patient varies depending on the type of rotator cuff tear, patient age, and medical co-morbidities. Surgical treatment options and the risks and benefits of each procedure for a patient should be discussed with their orthopaedic surgeon. Dr. Grutter can discuss treatment options and the risks and benefits of each. Every person and their particular circumstances are different. The rehab course follow surgery is determined for each patient individually. After surgery patients are typically placed in an abduction sling for 6 weeks. They may take it off to eat, shower, and to use the arm for desk work. Cold therapy devices (cryotherapy) are very helpful to deceases pain, improve sleep and decreases need for pain medication. Patients should not smoke for 8 weeks prior to surgery and 8 weeks after surgery. Smoking greatly decreases the body's healing responses and patients who continue to smoke after surgery have poorer outcomes than those who quit smoking. Patients generally start physical therapy 2-3 days after surgery. At 4-6-weeks patients may discontinue the sling, and begin overhead stretching exercises. Every person and their particular circumstances are different so the treatment for your shoulder may be different than those discussed above. Please read this information carefully. Write down any questions that you have about your injury and its treatment and discuss them with Dr. Grutter. Working together you and Dr. Grutter will determine the best treatment for you. Therapy proceeds through 4 phases. Phase 1: Passive Range of Motion (0 to 6 weeks). Phase 2: Active Range of Motion (6 to 12 weeks). Phase 3: Strengthening (10 to 16 weeks). Dr. Grutter's offices are located just outside Nashville in Gallatin, and Hendersonville Tennessee. Directions to the Gallatin office from Nashville or surrounding areas in Tennessee can be located here. Please contact our office if you are from outside the Nashville, Tennessee area and would like assistance in arranging lodging or transportation for a consultation.